This tattoo, a black and gray piece featuring an arrow and a lark, was inked by Javier Rivera (@jriveratattoo) at Live Free Tattoo (@livefreetattoo) in Atlanta. 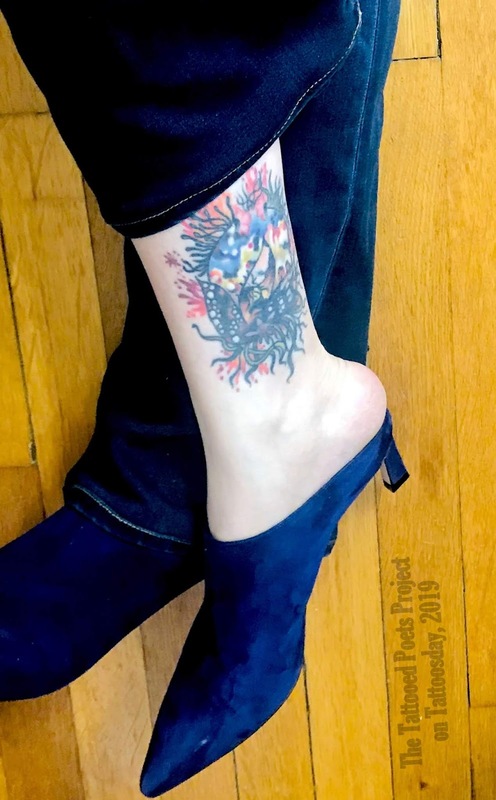 "I got this tattoo after I finished my first poetry collection, Arrow, which was also after one of my first mentors, Lucie Brock-Broido, died. The arrow is splitting the lark (in an homage to Emily Dickinson), and the flowers are larkspur as well as, in an homage to Lucie, wisteria. It’s on my right forearm as I’m right handed." "It’s a moose, in honor of Elizabeth Bishop’s poem, both because I love the poem and because it took twenty years for Bishop to get it right, which is one of my favorite compositional stories ever. I’m more fond of thinking of writing as slow labor than bursts of inspiration, and Bishop is one of my heroes in this regard. Of course, Bishop’s moose is 'antlerless,' but I love horns, so the one on my arm is a bit of a revision, too. The horns have flora integrated with them, and I picked the flora: there are marigolds, birch tree bark, and more." "This tattoo was actually originally a cover-up. When I first moved out as a teenager, I wanted to get a text tattoo as a kind of affirmation. The idea was to remind myself of who I was and who I wanted to be, and I wanted it on my ankle to guide me. I got as far as 'I am'—tattooed at Chameleon Tattoo (@chameleonbodyarts) in Cambridge, MA—and then stopped because I truly didn’t know what adjective or noun I wanted to follow that. So for about a bit over a decade or so, I had a tattoo of the words 'I am' on my ankle, in this exact spot. Then, in 2014, my sister died, and I became increasingly obsessed with the visual art of the brilliant Wangechi Mutu (@wangechistudio). Malia was an absolute genius; I went in with several pieces of Mutu’s art as inspiration and a few things that I wanted incorporated in honor of my sister and in honor of my own journey, and she came up with this multicolor piece that is also a perfect cover-up tattoo for the original 'I am.' I wasn’t ashamed of the 'I am': I just felt like it was time to put another layer on the palimpsest, so I’m actually quite fond of knowing it’s still in there." watching setting suns, like the ill-fated king, turn all to gold. Robert with the swans. Robert under the statue of Washington. with fishes on them, of forsythia and maple trees. between Boston and Cambridge, he saw Poseidon. the sailboats is a god, mighty and to be feared. could not long contain that god. In the pipes in his home, he heard the gurgle of illness. I smell illness in the riotous orchid blooms. eyes dim with bloodlust and the hiss of feathers. O sacred receptacle of my joys. I wrote it in a poem. I searched the seas for one. I searched the skies. I searched a painting. a soft, sudden darkness in my throat. O, how this villainy. In mourning, the owls are replaced by hawks. seem to have two pairs of hollow eyes. that sounds like the colors inside an oyster shell. creep hordes of trembling locators. The satellites stare with breath hitching in their throats. lies eight times the distance between the Earth and the sun. Saturnian moon lies life, report the satellites. toward alien oceans on other planets. What I am is all that I can carry, wrote Deborah. all that I missed, I carried. toward alien oceans. I am. I am looking, too, to alien men and women. I picture hurtling into them, by turn, to serve my lust. the different shades of a moan. reaching down to a woman’s hips. down to the river of gold. down to the river and drowns. lives in her excised tumor and stag-horn kidney stone. in the river I’ll be found. Why, then, I am the devil’s dam. Dangle me from a cliff, twelve thousand feet above sea. bid them trample my body. Watch, from a great distance, as the glass cracks. to the mouth. To the skull. To the groin. calling out, as wretches do, to failing life. reach the bottom of the Canyon, throw yourself in. your and our blood across the burnt-orange schist. See, O, see what I have done. I fear neither the sight of nor the word for blood. HMS Albatross has joined the search for the plane. It is May now, and there is no sign of it. forsythia, barbed wire, and burnt metal. craving owls at war under thick purple overhang. No territory there is that is not mine. The Albatross, it is mine. to moments colonized by theaters of the imagination. O monstrous. The O of a mouth without a tongue. starving on one another. Horns and cry of hounds. the arrow’s flight into the neck, the horses’ tumble into the canyon. with quills in its neck. A spilt cloud of felled bees. a single singer carving the melody. under steaming and frozen waters. Take me instead for the stag, the rifle, and the hunter. around carapaces, the moons of Saturn. as if they were the rarest blooms. above the gaping, hollow O of the earth. ALL IS LOST. FLEE THIS HOUSE. of my throat. O heavens, can you hear a man groan? Here nothing breeds but we fazed and hungry. O wondrous thing. writes the astronomer. It is June. of the river I’ll be found. My sister has joined the list of those I mourn. Her ghost lives in each powder-winged moth. shoes asphyxiation blue, hair the tones of flesh. so they throb as one bloodied yolk. as though in blissful death throes. is a dream of a gasp. die in the mass of horses in a pied flock of shrieking birds. comes a scent melodious and unearthly. like a print from a silvered glass plate. would reveal themselves to house celestial ash. As the stag, I fear the mouth of the rifle. As the rifle, I point my mouth, deadly, toward you. As the hunter, I execute myself so I may feast. Worlds such as this were not thought possible to exist. My lord, I aim a mile beyond the honeyed moon. Sumita Chakraborty’s first poetry collection, Arrow, is forthcoming from Alice James Books in the U.S. and Carcanet Press in the U.K. in September 2020. She is Visiting Assistant Professor of Women’s, Gender, and Sexuality Studies as well as Lecturer in English and Creative Writing at Emory University. Her poetry, essays, and scholarship have appeared or are forthcoming in POETRY, the American Poetry Review, The Rumpus, Best American Poetry 2019, the Los Angeles Review of Books, Cultural Critique, Modernism/modernity, and elsewhere. She is poetry editor of AGNI Magazine and art editor of At Length. In 2017, she was the recipient of a Ruth Lilly and Dorothy Sargent Rosenberg Fellowship from the Poetry Foundation, and in 2018, she was shortlisted for a Forward Prize. 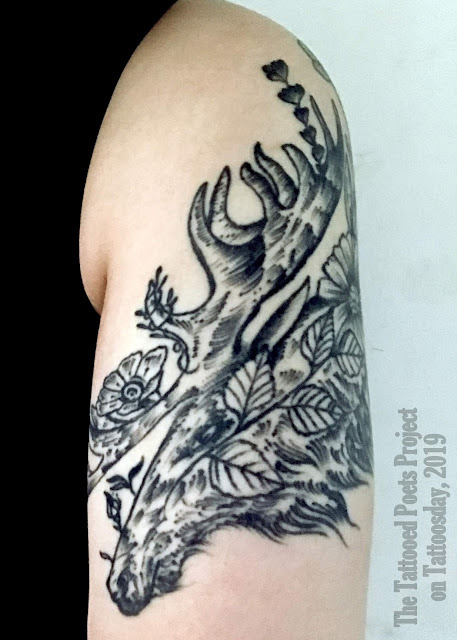 Sincere thanks to Sumita for sharing the three tattoos and her wonderful poem with us here on the Tattooed Poets Project on Tattoosday!